Lean Manufacturing In America – We CAN Make It In America! We CAN Make It In America! Take a look around your home… look at your clothes, dishes, appliances, cars, lawn mower, rugs and especially your electronics. Are these items “Made in America?” Chance are, they are not. Sadly, we have exported much of our manufacturing to other countries. Nothing against “other countries,” their people need to live and thrive every bit as much as we do here in America. In fact, we have worked for many US based companies that have interests throughout the world. We have also worked for companies based in other countries that have manufacturing plants in the USA. The strength of America is based in many things; freedom, democracy, unalienable rights, our Constitution, and other such foundational principles and practices. Much of our strength and leadership in the world has also come from our ability to manufacture the goods the entire world has used to modernize and improve the quality of life for billions. No other country has helped the world more than the United States of America! Our manufacturers are struggling to compete in a global economy and we feel their pain. How can we help? We can make a decision to “Buy American” a little more often… maybe even a lot more often. 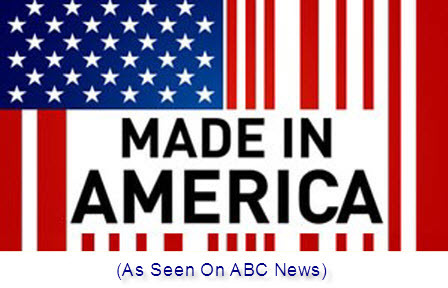 In the ABC News series called “Made In America” we learn some disturbing facts about just how far the tables have turned and how many American jobs have been exported. We also see great hope as we read about the impact even a small increase in purchases of American made products would have on our economy. As little as a 1% increase in purchases of US made products would decrease joblessness by more than 200,000 American workers. It seems that is an simple step; kind of a no-brainer, toward helping our economy grow once again. Lean Manufacturing is one of our greatest weapons for helping American companies grow and compete. We can become more efficient and learn to live by the Lean mantra “Better, Faster and Cheaper.” Lean (done right,) never sacrifices safety or quality; it liberates companies from wastes and creates bottom-line improvements. Made in the USA is more than just a good idea or a patriotic slogan. We need our American manufacturers to grow and be strong more than ever if the American Dream has a lasting chance; we say it does!